This paper seeks to explain the typical behavior of output during the transition from central planning to market in terms of a massive but gradual shift from the state sector to the private sector. The model is illustrated for the countries of the former Soviet Union (FSU) during the 1990s—a period when transitional factors are clearly the dominant influence. As the century turns, these transitional factors become harder to isolate from other factors such as the rise in the price of oil, exchange rate developments, and banking problems. The model can be used to explain the trajectory of output in most transition countries, including China, Vietnam, Central and Eastern Europe, and Cuba. In this paper, however, the sample is restricted to the countries of the former Soviet Union in order to simplify the analysis by maintaining a degree of historical, political and geographic homogeneity. The essence of the transition from plan to market is the transformation of the economy from one dominated by central command and control and state property to one where resources are allocated mostly through market mechanisms and where private property and decision-making predominate. The transition thus involves a process of creation and growth of private structures, and simultaneously the downsizing of the public enterprise sector through privatization, restructuring or liquidation.1 The interaction of these developments determines the evolution of total output. The over-all transformation process is asymmetrical: while the contraction of state production, once decided by the authorities, is fairly rapid, the expansion of private output takes time. This is because some or the capital released by the dying state enterprises has to be restructured before it can be effectively used under the new market conditions.2 At the same time, managers and entrepreneurs must go through a process of learning-by-doing, while workers acquire the skills required to operate in the new environment. 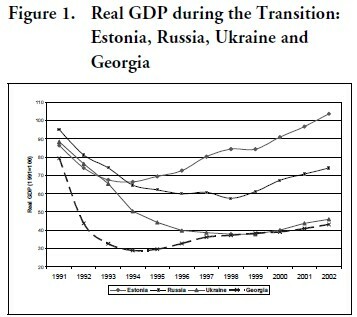 The behavior of output during the first decade of transition is illustrated in Figure 1, using four representative countries of the former Soviet Union (FSU). Two things come out clearly from the figure: first, in all countries aggregate production falls immediately after the beginning of reform and recovers gradually later in the period; and second, the specific time-path of output differs considerably among countries. These are the facts to be explained. It should be noted that the initial economic downturn can be observed in all the countries of the FSU, as well as those of Central and Eastern Europe, although not in China or Vietnam where output does not contract at the beginning of reform. • A sector producing “old goods” or “Type-2 goods.” Output in that sector responds to state orders and frequently benefits from large government subsidies. In most countries this sector initially accounts for the bulk of production. • A sector producing “new goods” or “Type-1 goods.” Firms in that sector produce without subsidies and sell in free markets under competitive conditions. The sector is initially small or inexistent, but then grows as a result of: (i) the emergence of new private firms and the expansion of self-employment; and (ii) the privatization of state enterprises. For convenience, the model identifies enterprises according to their status of ownership. Thus, producers of “new goods” are identified with non-state (private or cooperative) enterprises. Producers of “old goods” are identified with state-owned enterprises (SOEs).4 In the long-run, total factor productivity (TFP) is expected to be higher in the private sector than in the state sector. In the short-run, however, private TFP may lag because of the above-mentioned learning-bydoing process. The behavior of output is radically different in the two sectors. In the state sector, the output of old goods falls initially and, in most countries, continues to fall during most of the 1990s before leveling off at around 20 percent of GDP. By contrast, the output of new goods increases through most of the period, although more or less rapidly depending on the type of country. It is clear from Figure 1 that there have been significant differences among counties in the time path of output during the transition. The empirical literature on the subject attributes these differences in part to initial conditions (geographic location relative to market economies or length of the central planning period) and to political and military events. It also highlights the will and the effectiveness of the authorities in introducing (or resisting) pro-reform policies. Generally, the growth of the private sector is relatively fast in countries where authorities are sympathetic to reform and adopt strong pro-reform measures at an early stage (like the Baltic countries), and relatively slow in the weak reformers (like Ukraine). This comes out clearly from Figures 1 and 2. 4. Unusual countries (Belarus, Uzbekistan). To this we add a fifth category of countries, those affected by armed conflicts (Georgia. Armenia, Azerbaijan, Tajikistan), where the contraction of real GDP in the early 1990s is particularly severe, as indicated in Figure 1 for the case of Georgia. This section examines the evolving structure of output in the representative country for each of the groups defined above, using the distinction between private and state production. 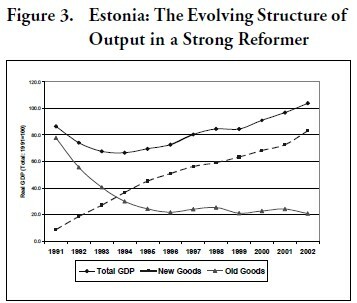 As indicated in Figure 3, output of old goods in Estonia falls sharply as soon as the transition begins. State production plunges, as state orders are abolished and policies unfavorable to state enterprises are rapidly put in place, and output in the “new goods” sector begins to rise early, but gradually. As a result, total output falls for 4 years, but then recovers briskly and reaches its initial level after 10 years. This scissors like shape is typical of other strong reformers in the region (like Latvia) and of other post-communist countries (like Poland and Hungary). 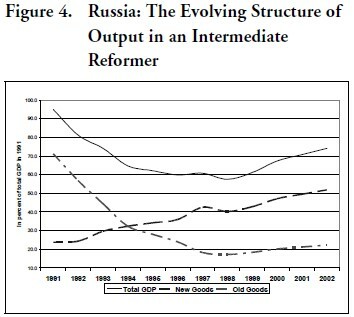 The overall pattern of transition in this group, illustrated in Figure 4 for the case of the Russian Federation, is similar to that of strong reformers. However, output of “old goods” falls more steeply, growth in the “new goods” sector is slower, and aggregate production thus recovers more slowly. Why does Russia not show up as a strong reformer in spite of an early big push on privatization and price liberalization? Perhaps for the following reasons. • In the first years of reform, Russia experienced a very high budget deficit resulting in part from effort to subsidize certain large state-owned enterprises (SOEs), the Far North, and the agricultural sector. • Because of the fiscal problem and the tendency by the Central Bank of Russia to provide credits at interest rates well below market rates, monetary policy was inflationary in the early years of reform. Inflation later subsided as a fixed exchange rate system favored by the International Monetary Fund was introduced. But this was accompanied by heavy issuance of government debt to finance continued fiscal deficits, and the result was the serious financial crisis of 1998. • Relations with other former Soviet republics that remained in the Ruble Area in 1992 were difficult. The behavior of some countries (notably Ukraine) contributed to aggravate inflationary pressures in Russia and other countries in the area. • The Yeltsin government inherited a foreign debt of more than $80 billion from the Gorbachev administration. Russia took over the debt of the other former Soviet Republics. • The decidedly pro-reform government of Egor Gaydar (with Fedorov in Finance and Chubais in charge of privatization) was followed after 2002 by mostly less reform-oriented governments. • Russia was the cradle of bolshevism and central planning. This might explain why free markets developed more slowly in Russia: command institutions were ingrained in society for more than 80 years, while in Central and Eastern Europe and in the Baltics these institutions were introduced much later. 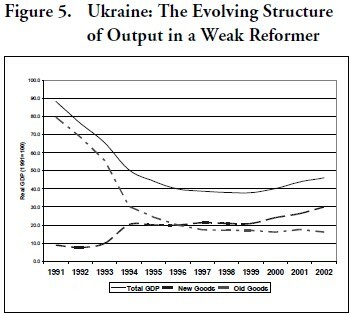 In the group of weak reformers (which includes Ukraine and Turkmenistan) the output of the “old goods”-producing SOEs fell even more dramatically, and for a longer period, than in the more advanced reformers (Figure 5). At the same time, output growth in the private sector remained very low. As a result, aggregate real GDP fell continuously for nine years and recovered only marginally towards the end of the period. Compared to the strong and intermediate reformers, the right hand side of the ”scissors” is relatively short and closed. Two countries in the former Soviet Union show an atypical pattern of output: Belarus and Uzbekistan. First, like Ukraine, both countries were weak reformers. But unlike Ukraine, they experienced a recovery of aggregate GDP approximately six years into the transition period. In the case of Uzbekistan, this reflected moderate growth of output in the private sector and some recovery of state production after 1997. The first has been attributed to the strength of the cotton sector and the second to the exploitation of Uzbekistan’s large energy resources. The case of Belarus is particularly puzzling. While growth in most other transition countries originated in the private sector, the recovery in Belarus resulted almost fully from a pick-up in the output of the state enterprise sector. There are three possible (and not mutually exclusive) explanations for the Belarusian puzzle. 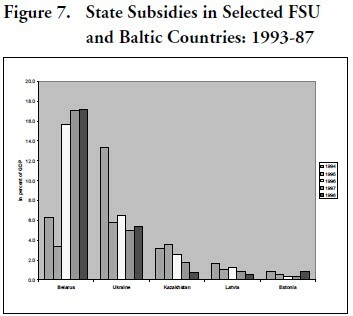 First, Belarus has been the largest provider of subsidies to SOEs, reflecting a decision by the government of President Lukashenko to keep many inefficient state enterprises afloat rather than to privatize them or close them. A significant share of these subsidies is financed by Russia, where Mr. Lukashenko apparently continues to have some allies. Second, Belarus’ authoritarian government has been able to impose discipline on state enterprises, limiting asset stripping and tunneling. Belarus’ score in the 2004 Transparency International Corruption Perception Index is 3.3, much worse than Estonia’s 6 but better than Russia’s 2.8, Kazakhstan and Ukraine’s 2.2, and Turkmenistan’s 1.9. Third, questions have been raised (by the European Bank for Reconstruction and Development, EBRD, among others) concerning the accuracy of Belarusian economic statistics. 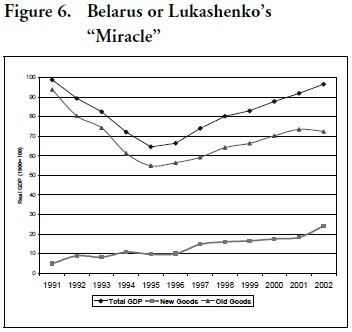 Whatever the explanation for the Belarusian mystery, the data we have indicate that it is not impossible for a planned economy to recover from the demise of the former Soviet Union, and to resume economic growth at some point. 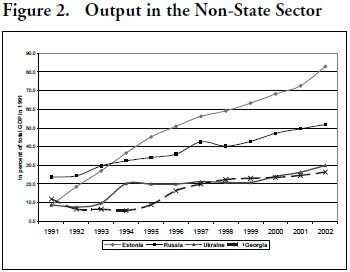 It is remarkable that the pattern of output in Belarus during the 1990s and early 2000s resembles that of Cuba, another authoritarian country and one which lost Russian subsidies but now benefits from considerable economic support from Venezuela. There are two important caveats however. First the resumption of growth in the mid 1990s in Cuba and Belarus is based on political dependence from abroad and therefore is hostage to fortune. Second, more than a decade after the dissolution of the FSU, Belarus and Cuba have deliberately failed to reform their economies and therefore remain incapable of providing the goods and services that their populations desire. As noted, the pattern of real GDP in certain countries in the region was significantly disrupted by armed conflicts. • In Georgia, owing first to rear-guard actions by the forces of former President Gamzakhurdia and then to the attempted secession of two regions, Southern Ossetia and Abkhazia. • In Armenia and Azerbaijan, because of the conflict over the region of Naborno-Kharaback. • In Tajikistan, due to the conflicts among government forces, communists, and Islamic militants. The disruptions imposed by these conflicts in some cases appear to have been severe (in Georgia real GDP fell to one third of the previous year’s level in 1990). Following the end of the conflicts, economic performance in these countries seems to conform increasingly to the classification of countries according to the strength of their reform policies—e.g., Armenia as a relatively advanced reformer, Tajikistan as a weak reformer. where y is aggregate real GDP, p indicates the extent of price liberalization, t the degree of trade liberalization, c represents the level of corruption, π is the rate of inflation, and s is the degree of subsidization of state enterprises. Each variable represents a vector of observations for the 14 countries of the FSU and for a number of years in the period 1991-2002.7 The intensity of the learning-by-doing process in the private sector is indicated by λ. It should be noted that the model presented above is not a growth model but a transition model, as the aggregate levels of capital and labor are assumed to be unchanged. Any explanation of the behavior of output beyond the first decade of reform would require the explicit consideration of these factors and other macroeconomic variables such as the price of oil. • Output in the private sector is expected to be positively affected by price and trade liberalization and negatively affected by inflation and by corruption. • The productivity of private enterprises is expected to increase over time with learning-by-doing, as the labor and capital released by disappearing SOEs are gradually re-trained and re-structured to produce efficiently under competitive conditions. • The output of SOEs is expected to be negatively affected by price and trade liberalization, and positively by subsidization. The capital of these enterprises (and therefore their capacity to produce) is adversely affected by asset stripping which is itself related to the prevalence of corruption. Because the coefficients of several variables are expected to have opposite effects on the private and the state sectors, the functions f1 and f2 must be estimated separately. Estimation of a single reduced form equation for total output, which has been the norm so far in the literature, makes it hard to identify these effects and therefore fails to capture important aspects of the transition process. The estimation results are summarized in Table 1 which also provides sources and definitions of variables. The table contains few surprises. 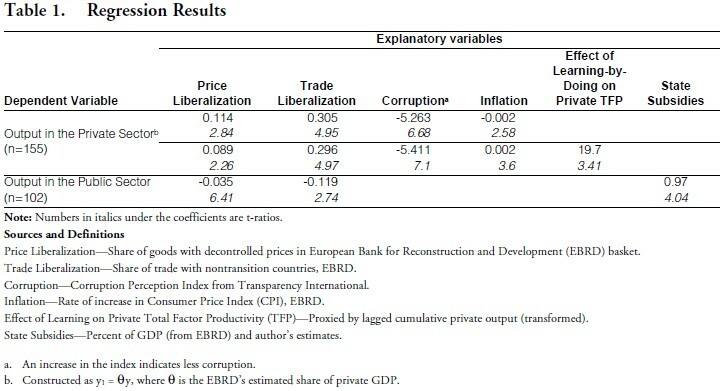 In the regression for the state sector, the coefficients of price liberalization and trade liberalization are negative, as expected, but subsidies help to sustain SOE production, which may account in part for Belarus’ unusual experience. Surprisingly, the corruption variable turned out to have the wrong sign and was removed from the equation. 1. It is mostly the public enterprise sector that is subject to this policy-induced destructive process. The public-goods producing Government sector (education, public health, defense, etc.) is generally unaffected, although it may well have contracted during the 1990s as a result of budgetary stringency or, in the case of Russia, a change in strategic conditions. 2. See Hernández-Catá, Ernesto, “Liberalization and the Behavior of Output During the Transition from Plan to Market,” IMF Staff Papers, December 1997. 4. This is of course a simplification. Some private or joint enterprises have benefited from subsidies, while some state-owned enterprises (SOEs) may have operated profitably without support. 5. See Allan Gelb, Martha de Mello, Cevdet Denizer and Stoyan Tenev, “Circumstance and Choice. The Role of Initial Conditions and Policies in Transition Economies,” Policy Research Working Paper 1866, The World Bank Development Research Group, December 1997. 6. This classification is based on Martha de Melo, Cevdet Denizer and Allan Gelb, “Patterns of Transition from Plan to Market,” The World Bank Economic Review, September 1996, Table 2, except that ”advanced” and “high-intermediate” reformers are lumped into one category, and that Belarus and Uzbekistan are treated as separate cases. 7. The precise number of years is determined by the availability of data. In particular, the sample for the state sector regression in Table 1 is lower than for the private sector regressions because of limitations on the data for subsidies. 8. The variable is constructed as a nonlinear transformation of the lagged value of cumulative private output.